Do you think of your business software as a cost or as an investment? Your business software is the central nervous system of your business. Whilst you are ‘in the battle’ running your business, it can be difficult to step back and see the big picture. After all, if everything is working and it isn’t broken – why fix it? The challenge is that there are significant hidden costs in legacy software that you may not be aware of. In a recent survey, 90% of business owners said that old business systems are stopping them from benefiting from modern digital technologies that they need to become more efficient and expand their businesses. Are your competitors investing in new systems and offering enhanced levels of customer service? Is your business falling behind in the race? You can keep an old car running for years, but is it safe? One day you will break down in the pouring rain, on the motorway. At some point, the answer is to get a new car and it is the same with software. Getting your software to ‘talk to’ third party applications used to be a nightmare. If you have a modern system, this is less likely to be a challenge. Old legacy systems are difficult to access. There is an incredible amount of useful data in there, but you just can’t reach it. Modern systems, on the other hand, are much more accessible. This means that you will will be better informed about your business, can make better decisions and serve your customers even better. Gradually, solving problems in old systems becomes harder and more expensive, doesn’t it? At some stage, the whole thing may fall over. What effect would this have on your business? Old systems have a dwindling pool of experts. On the other hand, new software such as that offered by Sharp-aX comes with a dedicated team of professionals who are ready and waiting to help you. How old is your system? Five years? Seven years? Ten years or perhaps even older? Many years of quick fixes, ad hoc maintenance and changes may have made the software unstable. Why do successful companies change their software every few years? Are you putting your business at risk? It is not unusual for two thirds of IT budgets to be spent on keeping old computer systems gasping along. With the right supplier, changing your computer system is a straightforward project. 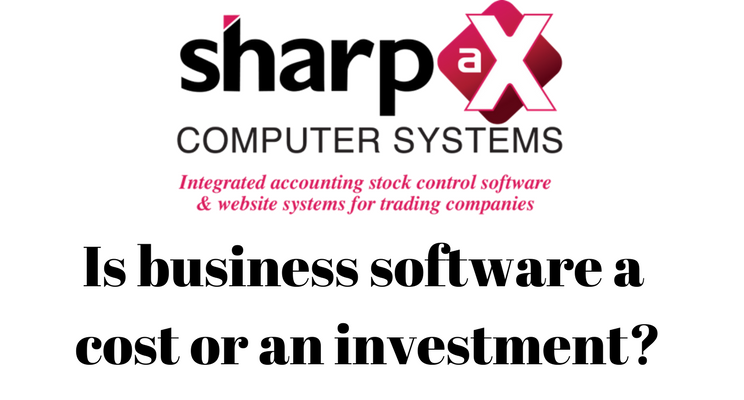 At Sharp-aX, we take a methodical, step by step approach to planning and implementing new systems for our clients every month. Old legacy systems are a cost which will probably get higher each and every year. A new computer system is an investment in the future success of your business. Why not do it now? Call us for a no obligation demonstration or visit our offices and meet the team – we are here to help.